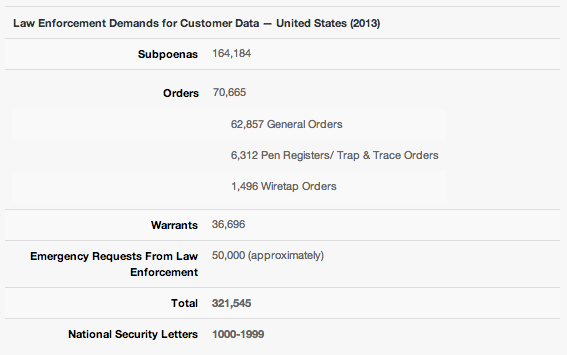 Of the 320,000+ requests, 1,496 were wiretap orders, approximately 50,000 were emergency requests from law enforcement, 36,000 warrants, over 6,300 were trap & trace orders, and the majority (at over 164,000) were subpoenas. The “vast majority” of these were consumer related, with only a few regarding their enterprise customers. Maybe it’s just me, but those numbers seem incredibly large. Then again, they do have almost 100 million postpaid subscribers. If you’d like to read further into each type of request, hit up the source link below.